Well, it's that time of month again when our good pal, Chewy sends us some treats to try out and share our thoughts with all our readers. It's a tough job but we certainly wouldn't want to let Mr. Chewy down! BOL! So this month we received Solid Gold's Cinna-Bone Holistic Biscuits. First, let's get the deets of these biscuits out of the way. Enough about the boring stuff, lets test these out! They smell just like the name says, cinnamon! If you'd like the Cinna-Bone Holistic Biscuits delivered right to your door, you can purchase them at Chewy.com, they are currently $7.55 for a 1lb. bag. Chewy.com can take care of all your pet's needs! Their website contains over 300 pet brands, great prices, outstanding customer service and speedy shipping service, that can't be beat. 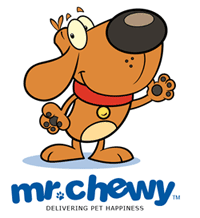 Be sure to follow Mr. Chewy via Facebook, Twitter and Instagram! We are joining the Tasty Tuesday Blog Hop hosted by Sugar and Kol. Head on over browse through all the yummy treats and link up one of your own! Disclosure: I received a bag of Cinna-Bone Biscuits in return for a review. All statements and opinions are completely my own. Bruin, I am seriously impressed at your patience and I finks you earned that WHOLE bowl full!!! I don't know if I've ever had a treat with cinnamon in it. I may just have to look into these since Bruin can't seem to get enough of them! OMD I think I want a box of those. Thanks for telling us all about how good they are! They look so yummy. Have a terrific tasty Tuesday. I've seen them before and once again they look so yummy I will have to order some for Harley. Thanks for the reminder Miley! These sound like the SnickerDoodles that we are giving away right now. Yum! Did your Mom want to eat one? Those treats look so awesome! We love chewy.com, too! We just LOVE Solid Gold Cinna-Bones AND Chewy.com!!! Great review Bruin! We were hesitant to try those just because I'm not sure how our pups would go for cinnamon. We may have to give them a try though. We LOVE Chewy.... they always have the best stuff for us to try! Those look yummy....we love cinnamon! We almost tried those this time, but went with something else instead. We definitely want to try these now though....great review!